I’m still currently going through a Stranger Things withdrawal. And if you’re in the same boat as me, then there might be a some relief for you in buying Barb’s 1988 Volkswagen Cabriolet. 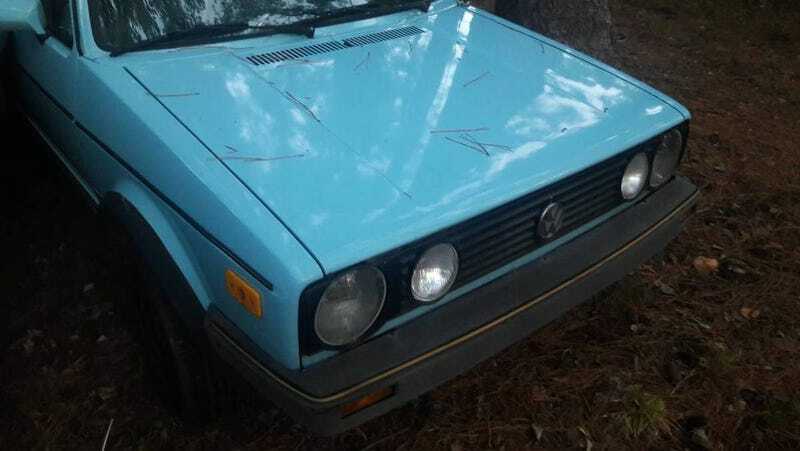 In the listing, the seller claims that this is the car that Barbara Holland drove in season one of the show, right before she gets snatched into the Upside Down and killed by the Demogorgon. It has a blue exterior, a gray interior and is an automatic. It also apparently has 123,000 miles on the clock. They wanted to cast Barb, an upper-middle class girl, with an appropriate car. A Rabbit convertible of that era certainly would have been a good choice—it was a desirable car for upper middle class girls across America. The only problem is that the one they found is actually a Volkswagen Cabriolet, what they later re-named the Rabbit convertible in 1985. You can tell this one is a 1988 because that was the first year of the plastic-covered bumpers and the smaller inner headlights. Anyway, the seller wants $15,000 for it, which is far too high. A quick and dirty web search yields an average price range of between $3,000 and $6,000. But then again, I only like Stranger Things, I’m no superfan. I’m just glad Barb got a proper funeral in the second season.